Above is a photo snapped during the first of this series of sunday protests in Vietnam, on June 5, 2011. This is an interesting photo, if one were to just take a look at some of the simple details in the picture, you will see what I mean. On one side, we have the anger and passion in the eyes of the protesters, expressing their love for their country under attack. On the other end, we have the Communist Police, looking down in shame because they realize that what they are doing is wrong. In suppressing the protests in Vietnam, the Communist Police are only preventing their own people from protecting their country. Thus, the Communist Police, through the orders of the Communist Party, are suppressing patriotism. 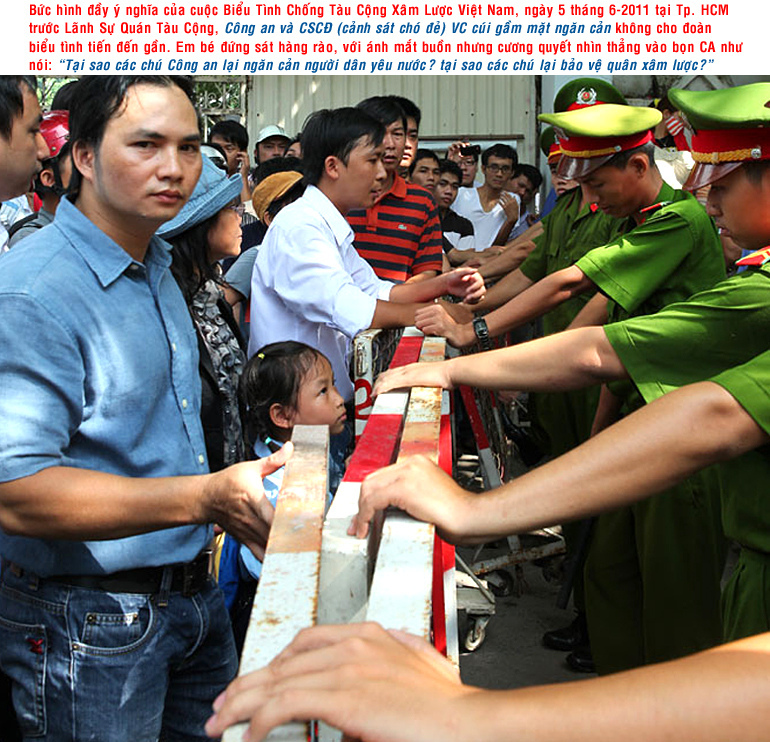 It is a shame that in a country like Communist Vietnam, one can get arrested for showing love for one’s country. Many of the dissidents detained in recent years are only guilty of one thing, if you can even call it guilt in the first place, loving their nation. It is good that the VCP decided to let the people protest against China as of late, but even this has been long overdue. The latest protests in Vietnam, happening only days ago, were not as big as they were supposed to be. The security forces in Vietnam have become weary of the size of the demonstrations, which have been steadily growing in successive weeks. As a result, they have taken measures to contain the size of these protests, making sure that the movement does not gain too much momentum. This is unfortunate, Vietnam has so much strength and potential, yet the Communist Party refuses to acknowledge this. They are afraid that if the movement gets too strong, it would ultimately lead to the fall of Communist rule in Vietnam. For this reason, they are expending their energy controlling the population instead of using this energy to strengthen the country. Right now, there are millions of people willing to give their lives to defend the nation. They are brave, fearless, with undying love for their homeland. Instead of suppressing these people, the Communist Party should be embracing them. Judging from the looks of things, even the Communist Police are feeling shame for holding down the patriotic movement in Vietnam. If the Communist Party could summon the courage to accommodate the positive forces instead of fighting them, the end result will be much less painful for them. Something they should think about. Protest is the word for Vietnam this weekend, as young Vietnamese people from all across the globe have risen to show their disgust for the crimes of Red China. From Paris to Tokyo, the people of Vietnam have come together in unity, expressing their undying love for their homeland in the face of Chinese aggression. The story however, is even bigger inside of Vietnam. Hours from now, possibly even as we speak, large-scale demonstrations are set to take place in the cities of Hanoi and Saigon. It is unclear how large these protests are going to be, or how long they will last. Even more unpredictable however, is what will happen once these demonstrations actually take place. The Communist Party in Vietnam has been extremely uncharacteristic as of late, allowing the people to protest against China, but even they have their limits. Last week, as the third round of protests were underway, the Communist Police in Saigon surrounded the homes of all prominent protest leaders and prevented them from participating. As a result, the scale of the protests in Saigon was dramatically reduced and quickly dispersed by the security forces of the VCP. The protests set for today are supposed to be the biggest by far, calling upon everyone in Vietnam to stand up and rise against the tyrannies of Red China. This can be a monumental event, but it can also have a terrible, violent outcome. As mentioned in the past, the Communists are professional killers, specially trained and bred to eliminate any threat in the name of the Party. A protest of this scale will almost definitely spark some type of Communist reaction. It is possible that there may be patriots within the Party itself, but even so, experience and history reminds us that the VCP can never be trusted. For now, the best we can do is support the people inside of Vietnam. If a real change were to come, the people inside Vietnam will be the ones to lead the way. We in the west too have the capacity to help the motherland, but for now, we are only on the outside looking in. In order to understand what Vietnam truly needs, one must understand how brutal the regime truly is. The people on the inside have shed blood, sweat, and tears through this regime every single day. For this reason, they will be the ones to make a change. There is no telling what will happen tonight, the only thing one can be sure of is that the people will not give up. For too long, the people of Vietnam have been terrorized by the Party, living through their ruthless repression, and watching them sell out to China. It is time the Party understood the determination of the Vietnamese people. If the government cannot defend the country, the people surely will. We will prevail. Remember last week when Vietnam came out to condemn China for their recent exploits in the Southeast Asia Sea? Well, the Chinese didn’t like that very much, so a few days ago, they went and did it again. This time, the Peoples’ Liberation Navy had a different approach. Instead of a full on naval vessel like the last time, the Communist Chinese sent in a smaller fishing boat to confront a different Vietnamese research boat. When the Chinese fishing boat got close, it used a fishing net to latch itself into the Vietnamese research boat. The PLN then sent in two of their military vessels to attack the research boat, claiming to defend the Chinese fishing boat from the Vietnamese boat. Like last time, the Chinese accused the research boat of being the armed aggressors. In response to this latest act of aggression, Hanoi has announced that it will be holding its own naval exercises in the Southeast Asia Sea. 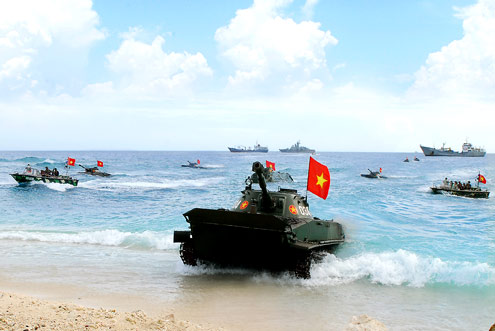 Hours from now, as monday comes earlier in Vietnam, the Vietnamese Navy will be conducting nine hours of naval exercises off their central coast. According to the Associated Press, this is the first time that the Vietnamese government is engaging in naval exercises of this scale using live ammunition. Hanoi has warned other countries to avoid the area. The Vietnamese government is finally doing what it should have done many, many months ago. The Chinese government has been harassing Vietnamese fishermen for years now, but the incidents have been especially heinous within the last two years. In Vietnam, the citizens have come together in protest for a second sunday in a row. Once again, the streets of Hanoi and Saigon were flustered with red flags, banners, and patriotic t-shirts. This problem with Communist China seems to be getting bigger by the day. An editorial published by China’s state-run newspaper had warned Vietnam not to start trouble with China, making references to history, and alluding to the 1000 years occupation. In my opinion, if one wanted to look at the history between China and Vietnam, look not at the 1000 years of occupation, but the 1000 years of victory after that. In the words of Nguyen Trai, “Our nation may be strong at one time and weak at another, but never in time have we suffered from a lack of heroes.” No matter which way the wind takes us, we will prevail. 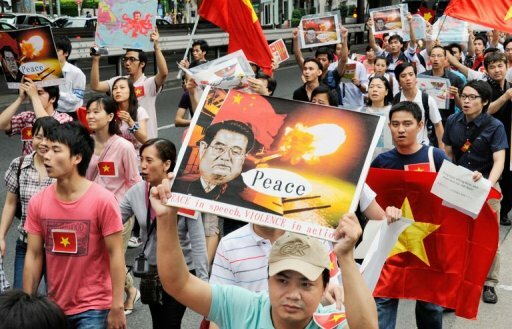 The Vietnamese people have taken to the streets in reponse to the Chinese invasion of the Paracel and Spratly islands. Earlier today, the people of Vietnam gathered outside of the Chinese Embassy in Hanoi to demonstrate against the recent acts of aggression of the PRC in the South China Sea. Hundreds also met up in Ho Chi Minh City, aka Saigon, to protest against Communist China. Wearing red t-shirts and carrying flags and banners, the protesters stood outside the embassy chanting slogans comdemning China for their expansionist and belligerent nature. The police and security forces watched the demonstration take place for a time before dispersing the people and making them leave the protest areas. In Hanoi, the protesters then marched towards Hoan Kiem Lake, a historical landmark of Le Loi and Nguyen Trai’s time, singing the national anthem and chanting anti-Chinese slogans. From what has been shown so far, the Vietnamese government did not crush the demonstrations in a violent manner. Though it is never certain, there is no coverage that the Communist police used many repressive tactics to hurt the protesters in Vietnam. For once, it seems, the Communist Party is actually on the side of the people in regards to this China problem, within their own limits however. The future is always uncertain when it comes to the Communists. One can only hope that similar events such as these occur more often. What the Communists decide to do now will determine their fate in the near future. They would be wise not to antagonize their people anymore. Instead, they should try to make incremental changes to improve the country and better the lives of the people. Doing so will significantly reduce the bloodshed and violence that will surely take place if this tyranny were to continue any longer. Governments rise and fall, but the people are forever! 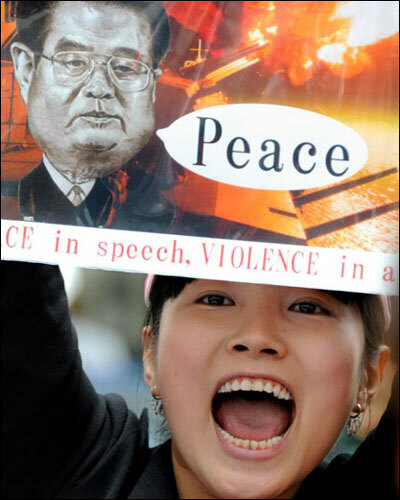 It seems that the PRC is at it again, engaging in acts of terror, sabotage, and harassing innocent civilians. This time, the victims are the members of a Vietnamese survey boat. 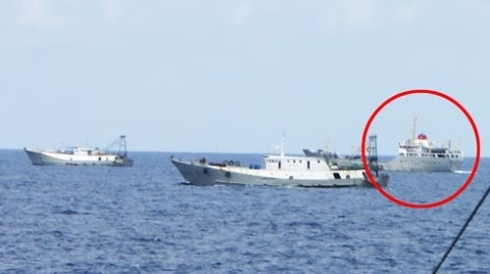 It is alleged that three Chinese military vessels entered Vietnam’s territorial waters, 120 nautical miles off of Vietnam’s central coast in Phu Yen province. The Chinese vessels then followed through by cutting the research cables of the survey ship as an act of intimidation against the Vietnamese vessel. This said vessel is the property of PetroVietnam, a Vietnamese oil and gas company conducting research in the Southeast Asia Sea. 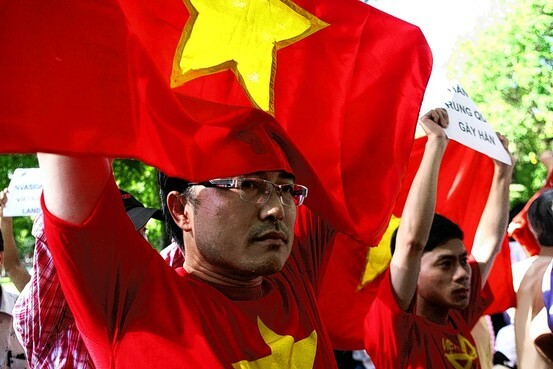 The government in Beijing has accused Vietnam of violating China’s territorial rights, complaining that the place of the incident was within China’s jurisdiction. This claim, along with many of the other territorial claims made by China, is completely bogus. This confrontation happened only 120 kilometres off of Vietnam’s central coast, compared to the 600 kilometres it takes to even come close to Hainan, an island currently under China’s control. The only argument China has is that the whole sea of Southeast Asia belongs to them, so any type of operation that any other country conducts is in violation of their “indisputable sovereignty.” It’s obviously bogus, but that’s what the Communists in China are saying. Relative to previous instances, Hanoi has taken a surprisingly stronger stance in response to China’s latest act of aggression. 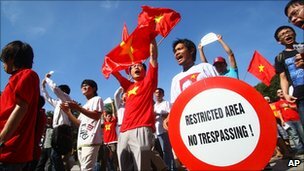 The Vietnam government has actually called China out on their recent attempt to intimidate the civilians of Vietnam. In an uncharacteristic move, Hanoi has proclaimed that they are prepared to use force to the utmost capacity if a similar incident were to occur in the future. Meaning that if China were to attack again, Vietnam will be prepared for war. Though I do not advocate a war between Vietnam and China, or any type of war, for that matter, I am in 100% support of fighting to defend one’s country. It is obvious that the Communist Party of China plans to invade Vietnam at some point in the future. Thus, it is a must that the people of Vietnam prepare to defend the country against a future conflict with the Peoples’ Republic of China. The young people of Vietnam are now becoming aware of China’s intentions to invade and are preparing to protest these acts of aggression. It is my hopes that the Vietnamese government let the young protest against China, and for the VCP to understand that patriotism is not a crime.